You’ve been seeing these strange looking rust-colored stains on your bed sheets and mattress. You aren’t quite sure what to make of them. Are these bed bug stains, and if so, what do they mean? Do you have a full-blown infestation on your hands? 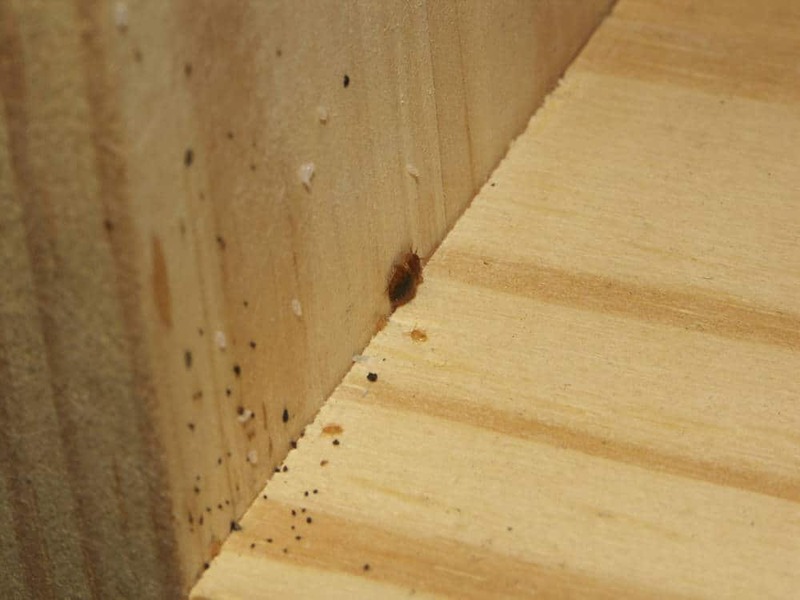 Continue reading to learn everything you need to know about each type of stain and how it can be evidence of bed bugs in your home. Are Stains a Definite Sign Of A Bed Bug Infestation? When you see tiny rust-colored smears on your bedding, it’s not slam-dunk-certain that it’s been caused by a bed bug, but it does give you probable cause to lead a full-scale search of your bedroom to see if you can spot any of these pesky bugs. 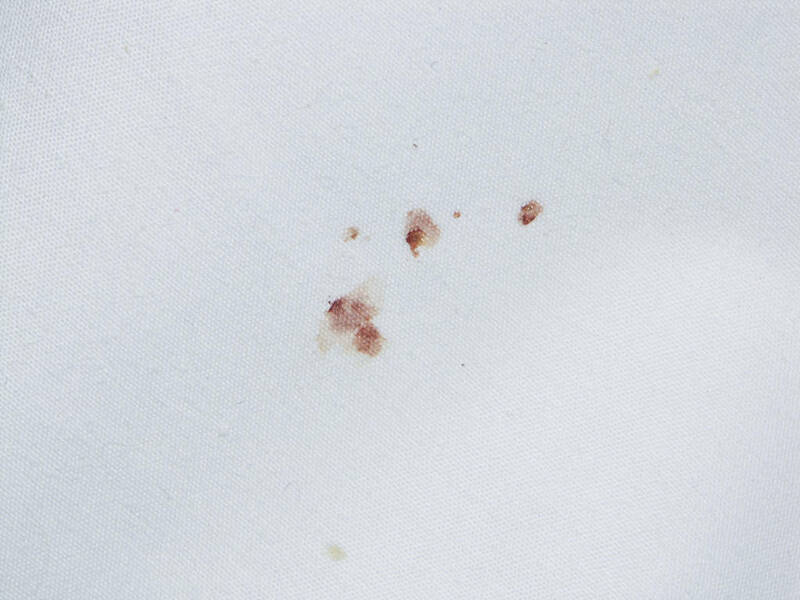 The reason for the little blood smears you’ll see on your mattress is because bed bugs can be messy eaters at times. They have a habit of not shutting their mouths all the way when they bite you. That can lead to small drops of blood leaking out onto your bedding. Engorged bed bugs can also burst and splatter if you roll over them in your sleep, leading to larger splats of blood on your mattress. Keep an eye out in hotels and hostels for old, faded blood splatters on bedding, as these could be subtle hints that there may be a bed bug problem nearby. If the stains you are seeing on your bed aren’t rust-colored, but more like dark brown or black in appearance, it could still be bed bugs. You may be seeing their droppings, which is a good sign you may have a bed bug problem. Marks caused by bed bug excrement won’t rub off of your mattress or sheets. They can also look like they’ve bled into the material. It might look like you’ve put the tip of your marker against your bed. 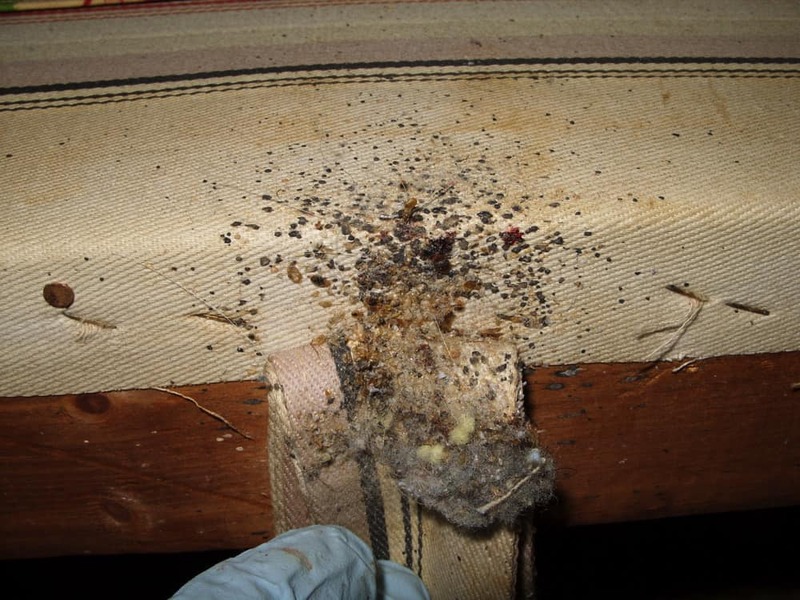 Bed bug excrement is often located where bed bugs spend a lot of their time – hiding along the seams of the mattress, but if your bedroom has a lot of bedbugs, their droppings might not just be confined to your bed. 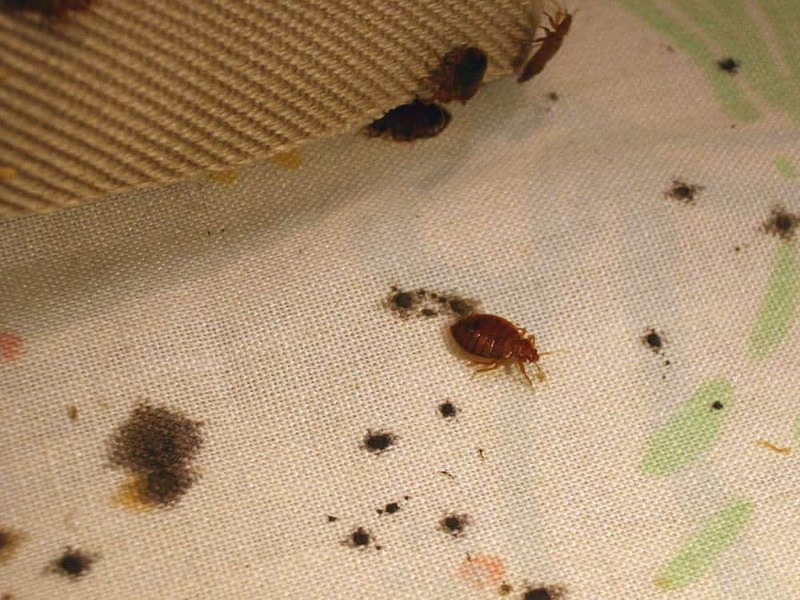 They could be on your rug, behind the headboard, and anywhere else a bed bug thinks they’ll find a good hiding place. Bed bugs don't make nests as such, but they do tend to congregate, so use this to your advantage in your search. Dark spots on your bedding can also be caused by bed bugs being crushed. Bed bugs are relatively flat, but that doesn’t mean that they can’t be crushed. Bed bugs come out primarily at night to feed off the unsuspecting person lying in bed. But if the person rolls around or reaches out to scratch at their skin, they can crush a roaming bed bug. That will cause a dark or rusty-looking spot on the mattress, much like excrement or blood spots would. If you see stains on your mattress that you suspect could mean you have bed bugs, remember that old adage, “Where there’s smoke, there’s fire.” While stains on your mattress could potentially be something else, like another insect that met his end in your bed, it’s also very likely that you could be looking at a serious bed bug problem. That becomes even more likely if there are a bunch of stains on your bed. While a stray mosquito could cause a blood spot if you killed it while in bed, there wouldn’t be as many spots as there would be with bed bugs. If you notice multiple stains or you know you’ve been exposed to bed bugs at a hotel or at a friend’s house, you should start looking for evidence of an infestation if you see a lot of potential bed bug stains on your bed. Even if there are just a couple stains, you might want to search around just for your own peace of mind and to nip any possible problem in the bud. The smoking gun would, of course, be finding a live or dead bed bug. But those can be notoriously hard to spot because they are well-versed at hiding from you – their survival often depends on it. But if you see stains and you haven’t managed to locate a live or dead bed bug, start looking for other signs. You can search for molted exoskeletons. 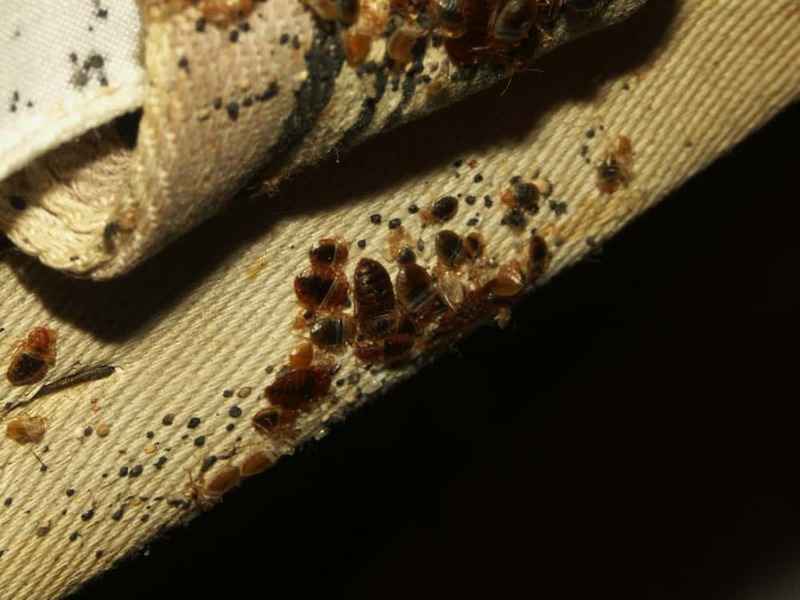 Before bed bugs become adults, they’ll molt their exoskeletons five times. 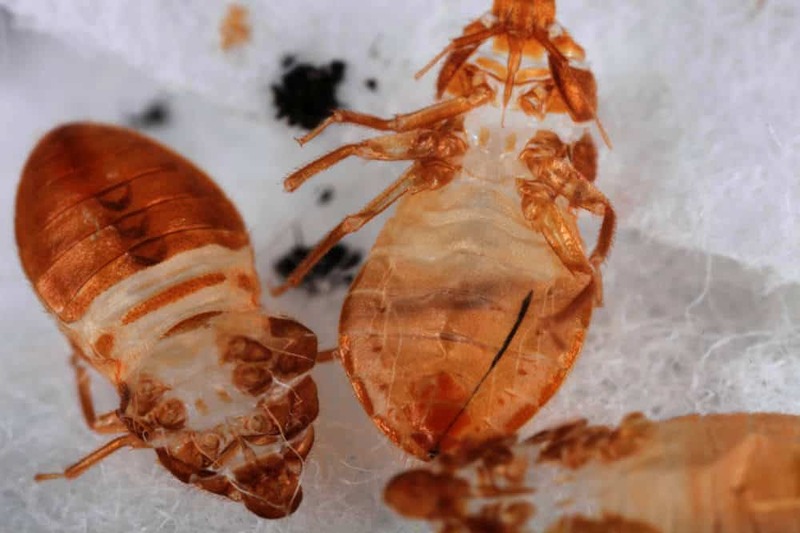 The molted skin will be similar in shape to the actual bed bug – it will look like they just stepped out of their skin. The only difference is that the molted exoskeleton will look translucent in color instead of brown like the actual bed bugs would. 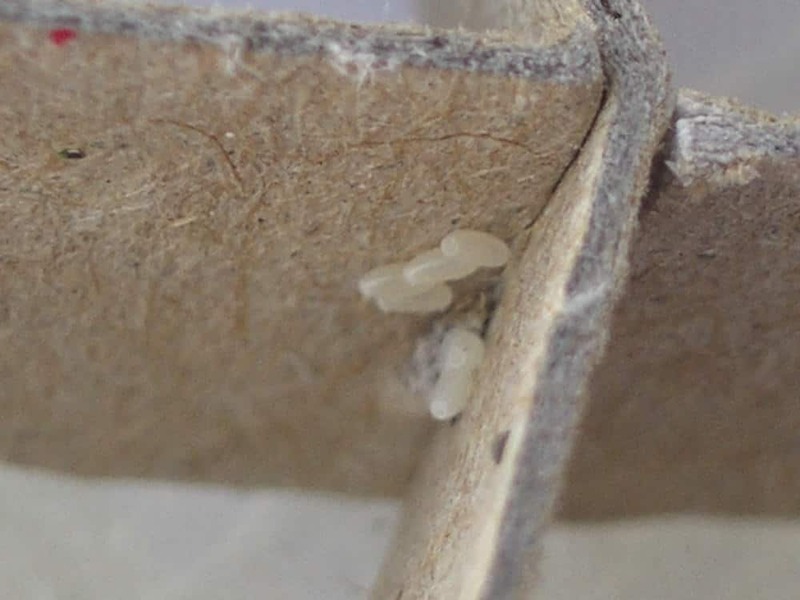 To find molted skin, you should look for them right around the mattress seams, along the floorboards of your room and behind the headboards of your bed. If you don’t see any signs of moltings, you can look for eggs. These will be extremely small and whitish looking. Because they are so small, you may need a flashlight and a magnifying glass to assist you while you’re searching for them. If you can’t manage to locate any exoskeletons or eggs, you should pay less attention to what you see on your bed and more attention to what you see on your skin. If you’re noticing consistent red-colored, itchy bites on your skin, it could point to a bed bug problem. If the stains you spot are on your mattress, try rubbing a dry washcloth on them. If the stains are recent, that may be enough to remove them. If that doesn’t work, you can spray your mattress with a bit of a stain remover that contains enzymes. Let it sit on the mattress for as long as the instructions on the bottle tell you to. After that, take a wet washcloth and work the stain over until it’s gone. If the stain is on your sheets, you can spray the stain remover, let it sit for the designated amount of time, and then wash it as normal. Bed bug stains can be a big source of frustration and they can linger long after the exterminator gets rid of your bed bug problem. Since you’ve already spent so much money removing the bed bugs, you don’t want to have to replace your bedding and mattress too. These washing tips should help you avoid that problem. Being bitten at night with no signs of bed bugs can lead you down a path of not knowing what to look for, but bed bug stains, while annoying, can be one of the best ways to recognize that you may have a bed bug problem. Use these stains to help you get one step closer to identifying and eliminating your infestation.